Labor pain is one of the most painful situations a human can experience. Painful uterine contractions cause maternal hyperventilation and increased catecholamine concentration resulting in maternal, fetal hypoxemia, and adverse effects on the course of labor. Effective labor analgesia leads to better maternal and fetal outcome. Neuraxial analgesia is considered gold standard for labor pain management. It provides complete analgesia for both first and second stages of labor. Bupivacaine is being used for labor analgesia because of its least placental transfer due to high protein binding. To minimize the motor blockade caused by bupivacaine, various adjuvants are added. Traditionally, fentanyl has been extensively used for this purpose. Dexmedetomidine is a highly selective α2 adrenergic receptor agonist having diverse actions such as anxiolysis, sympatholysis, analgesia, and sedation. It does not cross placenta significantly. When added to bupivacaine, it increases the duration of labor analgesia. Although United States Food and Drug Administration (FDA) and Drug Controller General of India (DGCI) have not approved “off-label” use of intrathecal or epidural dexmedetomidine in parturients, its use as an adjuvant to neuraxial local anesthetics is widespread. Several studies have used dexmedetomidine intravenously and epidurally in labor without any adverse effects on mother or fetus., This study was conducted to compare the efficacy of dexmedetomidine and fentanyl as an adjuvant to intrathecal bupivacaine for labor analgesia during normal vaginal delivery using combined spinal epidural (CSE) analgesia technique. This prospective, randomized double-blind study was conducted on 60 parturients after obtaining permission from the hospital ethical committee. The parturients who consented for CSE labor analgesia and fulfilled inclusion criteria were divided into two groups by computer-generated random number table. Inclusion criteria were booked antenatal cases at term, uncomplicated pregnancy scheduled for normal vaginal delivery, vertex presentation not in fetal distress, and singleton fetus. Exclusion criteria were patient refusal, local infection, altered coagulation profile, previous cesarean section, preexisting systemic or neurological disease, and severe deformity of the spine. 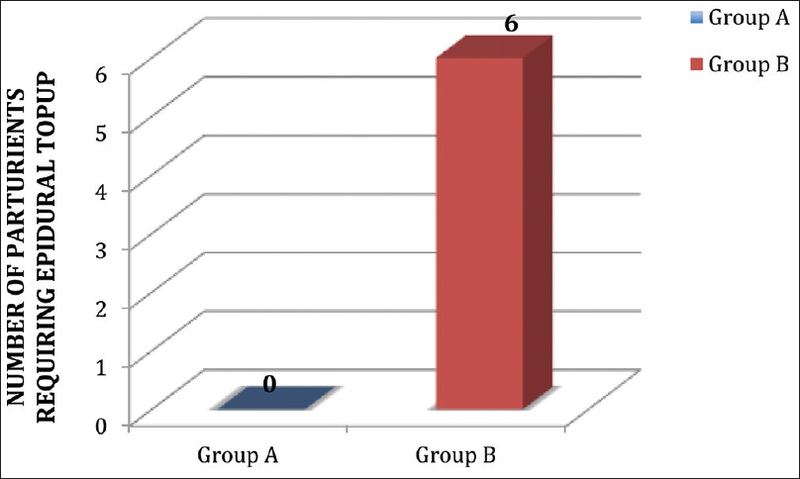 Parturients in Group A (n = 30) received an intrathecal injection of 0.5% hyperbaric bupivacaine 2.5 mg (0.5 mL) and dexmedetomidine 5 μg (0.5 mL diluted in normal saline); whereas, parturients in Group B (n = 30) received an intrathecal injection of 0.5% hyperbaric bupivacaine 2.5 mg (0.5 mL) and fentanyl 25 μg (0.5 mL). Total volume was made 1.5 mL with normal saline in both groups. Epidural top-up for rescue analgesia was done by 10 mL of 0.125% isobaric bupivacaine. All intrathecal injections were prepared by an anesthesiologist not directly involved in the study [Figure 1]. After taking proper aseptic precautions, CSE analgesia technique using a needle-through-needle approach was performed at L3–L4 intervertebral space with patient in sitting position. An intrathecal injection of prefilled drug was administered after observation of free flow of cerebrospinal fluid. The time of intrathecal injection was noted, and monitoring of clinical parameters, VAS, and side effects was initiated. An epidural catheter was then inserted 5 cm into epidural space through CSE set and secured for future administration of rescue analgesics. The parturient was repositioned supine with left-uterine displacement. An investigator blinded to intrathecal injection recorded all observations. The frequency and intensity of uterine contractions, dilation and effacement of cervix, descent of presenting part, fetal heart rate, and requirement of oxytocin were assessed using partogram chart by attending obstetrician. The requirement for instrumental deliveries or cesarean section was also noted, and such parturients were excluded from the study. The assessment of sensory blockade was done using the loss of sensation to pinprick in midclavicular line bilaterally. The onset of sensory blockade was defined as the time from intrathecal injection to the time when a sensory level of T10 was achieved. Quality of analgesia was assessed by using VAS score. VAS was recorded every minute after intrathecal injection for the first 5 min and then at an interval of 15 min. The onset of analgesia was defined as the time from intrathecal injection to the time of recording a VAS less than 3 during active uterine contraction. Duration of analgesia was defined as the time from intrathecal injection to the time when VAS was again recorded more than 3. The first top-up of 10 mL of 0.125% bupivacaine was administered at this point of time. Repeat top-ups of the same dosage were administered as and when necessary to keep VAS less than 3 till delivery. Maternal hemodynamic parameters were recorded every 3 min interval up to 15 min, and then at a 15-min interval. Fetal heart rate was continuously monitored using a cardiotocograph. Parturient was examined for any motor blockade using a modified Bromage score. The incidence of any side effects such as maternal hypotension, bradycardia, nausea, vomiting, pruritis, drowsiness, respiratory depression, urinary retention, and fetal bradycardia was observed and treated accordingly. Neonatal outcome in terms of mode of delivery, neonatal APGAR score at 1 and 5 min of birth, and any need for resuscitation were recorded. The progress of labor was assessed by measuring mean cervical dilation per hour by the attending obstetrician. After delivery, post-delivery patient satisfaction was graded on a 4-point scale (1 = excellent, 2 = good, 3 = fair and 4 = poor). Based on a previous study, for a 40% difference in the duration of labor analgesia, the expected sample size requirement for 80% power and an alpha error of 0.05 was 23 per group. To allow for study error and attrition, 30 patients were included in each group. Statistical analysis was performed using the software Statistical Package for the Social Sciences (SPSS) version 21 (Armonk, NY: IBM Corp). Standard qualitative and quantitative tests were used to compare the data (e.g. unpaired student t-test, ANOVA, Chi-square); P value of 0.05 was considered to be significant. 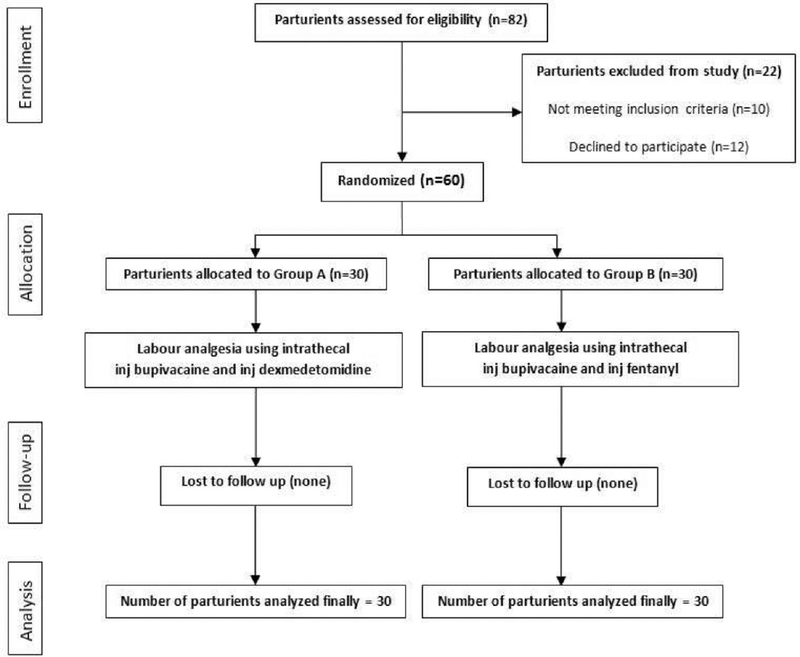 There was no significant difference between the two groups with respect to maternal patient characteristics such as age, weight, height, parity, gestational age, baseline VAS for pain, and cervical dilation at the initiation of labor analgesia [Table 1]. In both the groups, the baseline VAS score at which neuraxial labor analgesia was performed was between 7 and 10. The mean onset time of labor analgesia (VAS <3) was 1.27 ± 0.37 min in Group A, while in Group B it was about 3.27 ± 0.37 min (P < 0.0001) [Table 2]. The mean time of onset of sensory block in Group A was 4.27 ± 0.45 min, while in Group B it was 6.20 ± 0.61 min (P < 0.0001). The highest sensory block levels in both groups were comparable [Figure 2]. 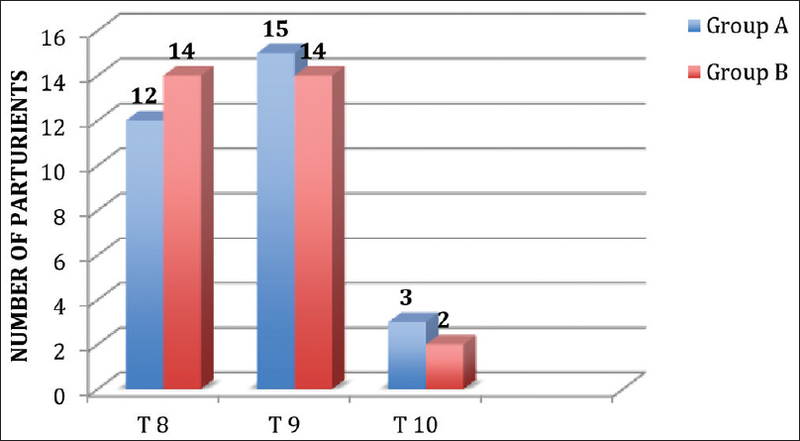 The motor blockade (modified Bromage Score 1) was observed in six parturients in Group A, while it was observed in four parturients in Group B. The remaining parturients did not have any motor blockade. No parturient reached modified Bromage Score of 2 or more. The mean onset time of the motor blockade in Group A was about 4.0 min, while in Group B it was about 5.0 min. The mean duration of the motor blockade in Group A was 38.75 ± 2.05 min, while in Group B it was 26.25 ± 2.50 min. In both groups, parturients regressed to modified Bromage Score of 0 well before the beginning of the second stage of labor. The mean duration of labor analgesia in Group A was 254.17 ± 4.75 min, which was significantly longer than in Group B (123.67 ± 6.01 min) (P < 0.0001) [Table 2] and [Figure 3]. An epidural top as a rescue analgesic was needed by six parturients (20%) in Group B. On the contrary, in Group A, the VAS score remained less than 3 for about 240 min and no parturient requested for rescue analgesic. Overall patients had excellent pain relief in Group A [Figure 3] and [Figure 4]. Mean duration of the active phase of the first stage and the second stage of labor was comparable in both groups. The mean rate of cervical dilation in Group A was 2.89 ± 0.63 cm/h, while in Group B it was 2.81 ± 0.64 cm/h (P value was 0.60) [Table 3]. Mean maternal pulse rate, systolic and diastolic blood pressures, oxygen saturation, and fetal heart rate were comparable from baseline value in both groups, and the difference between the two groups was statistically insignificant (P > 0.05). The mode of delivery in all parturients was vaginal although fundal pressure was required to be applied in few cases. APGAR score of newborns at 1 min was between 6 and 8 and at 5 min was between 8 and 9 in both groups. There was no event of fetal respiratory depression. No serious complications were encountered in our study. Two parturients in Group A and three in Group B had nausea; two parturients in Group B complained of pruritus; two parturients in Group A and one in Group B had mild bradycardia. One parturient in Group B had hypotension that was treated with intravenous fluids. Vomiting, sedation, and fetal distress were not found in any group. Post-delivery patient satisfaction score was better for Group A than Group B. Score 1 in 46.7% parturients in Group A and 33.3% in Group B; score 2 in 50% parturients in Group A and 46.7% in Group B, and score 3 in 3.3% in Group A while 20% parturients in Group B. Labor analgesia has evolved over many years. Comprehensive programs for labor pain management aim to minimize the motor blockade and avoid prolongation of labor. The CSE technique is commonly practiced for labor analgesia., Lipophilic opioids such as fentanyl have been used extensively intrathecally and epidurally for labor analgesia as adjuvants along with local anesthetics. Fentanyl causes inhibition of transmitter release along with a direct postsynaptic effect, causing hyperpolarization and reduction in neuronal activity. A synergism between fentanyl and bupivacaine has been reported in a study by Wang et al. Dexmedetomidine, an α2 adrenergic receptor agonist, has antinociceptive action for both somatic and visceral pain. It does not cross placenta significantly (0.77 maternal/fetal index). Studies also show that dexmedetomidine increases the frequency and amplitude of uterine contractions directly. Thus, we hypothesized that dexmedetomidine may prove to be a good choice as an adjuvant to local anesthetics for labor analgesia. In our study, CSE analgesia was performed and either intrathecal hyperbaric bupivacaine 2.5 mg with dexmedetomidine 5 μg or hyperbaric bupivacaine 2.5 mg with fentanyl 25 μg was administered in parturients when they demanded labor analgesia. Palmer et al. studied the effect of different doses of fentanyl for labor analgesia and found that at 25 μg dose, the duration of analgesia was 90 min with least maternal and fetal hemodynamic changes. Various clinical trials and meta-analysis have demonstrated safety of intrathecal dexmedetomidine in humans. [12–14] Doses varying from 3 to 15 μg have been used as adjuvant to bupivacaine for spinal anesthesia. Based on previous studies, a lower dose of dexmedetomidine (5 μg) was used with hyperbaric bupivacaine to produce good analgesia with minimal side effects. Qualitative reviews and meta-analysis on the role of dexmedetomidine in neuraxial blocks have concluded that it is a favorable local anesthetic adjuvant providing prolonged analgesia and decreased requirement for rescue analgesia. The prolonged analgesic effect of the addition of dexmedetomidine is due to its synergism with local anesthetics. Dexmedetomidine acts on the receptors of substantia gelatinosa in the dorsal horn of the spinal cord, which inhibits firing of nociceptive neurons stimulated by peripheral Aδ and C fibers. It also inhibits release of nociceptive neurotransmitter substance P. Dexmedetomidine provides analgesia for both first and second stages of labor; whereas, somatic pain of the second stage of labor cannot be effectively blocked by fentanyl alone. The progress of labor was not affected in either of the groups in our study. The rapid onset of analgesia decreases maternal catecholamine levels (mainly epinephrine that has tocolytic action) leading to increase uterine activity. The rapid rate of cervical dilation may also be due to direct action of dexmedetomidine on human myometrium as reported by Sia et al. who studied the effects of clonidine and dexmedetomidine on strips of pregnant human myometrium obtained from six individuals during elective lower segment cesarean section and explained that dexmedetomidine increases the frequency and amplitude of uterine contractility. Higher doses of local anesthetics administered neuraxially in women undergoing the birthing process can impair motor function that can result in a higher rate of instrumental delivery and cesarean sections. The motor blockade observed in our study was minimal (modified Bromage Score 1) and regressed completely (modified Bromage Score 0) before the commencement of the second stage of labor. Maternal hemodynamic parameters in both groups remained within acceptable limits throughout the study and were comparable. There was no event of fetal bradycardia in any group, and babies born had normal APGAR scores. Fentanyl being highly lipophilic is retained by placental tissue. Dexmedetomidine also does not cross placenta significantly. No serious complications were encountered in our study. In conclusion, 5 μg of dexmedetomidine provides a better alternative to 25 μg fentanyl when added as an adjuvant to intrathecal bupivacaine 2.5 mg for labor analgesia. It provides excellent and longer pain relief with minimal side effects and no delay in the progress of labor in comparison to the addition of fentanyl. Chestnut DH, Wang CA, Tsen LC, Ngan Knee WD, Beilin Y, Mhyre JM. Chestnut's Obstetric Anesthesia: Principals and Practice. 5th ed. Philadelphia, PA: Elsevier Saunders; 2014. Swain A, Nag DS, Sahu S, Samaddar DP. Adjuvants to local anesthetics: Current understanding and future trend. World J Clin Cases 2017;5:307-23. Palmer CM, Cork RC, Hays R, Van Maren G, Alves D. The dose response relation of intrathecal fentanyl for labor analgcsia. Anesthesiology 1998;88:355-61. Nair AS, Sriprakash K. Dexmedetomidine in pregnancy: Review of literature and possible use. J Obstet Anaesth Crit Care 2013;3:3-6. Hanoura SE, Hassanin R, Singh R. Intraoperative conditions and quality of postoperative analgesia after adding dexmedetomidine to epidural bupivacaine and fentanyl in elective cesarean section using combined spinal-epidural anesthesia. Anesth Essays Res 2013;7:168-72. Dilesh PK, Eapen S, Kiran S, Chopra V. A comparison of intrathecal dexmedetomidine verses intrathecal fentanyl with epidural bupivacaine for combined spinal epidural labor analgesia. J Obstet Anaesth Crit Care 2014;4:69-74. Fyneface-Ogan S, Gogo Job O, Enyindah E. Comparative effect of single shot intrathecal bupivacaine with dexmedetomidine and bupivacaine with fentanyl on labor outcome. Anesthesiology 2012;2012:1-6. American College of Obstetricians and Gynecologists Committee on Obsteteric Practice. Analgesia and cesarean delivery rates. ACOG Committee Opinion No. 339, 2006. Obstet Gynecol 2006;107:1487. Wang C, Chakrabani MI, Whitwam JG. Specific enhancement by fentanyl of the effects of intrathecal bupivacaine on nociceptive afferent but not on sympathetic efferent pathways in dogs. Anesthesiology 1993;79:766-73. Sia AT, Kwek K, Yeo GS. The in vitro effects of clonidine and dexmedetomidine on human myometrium. Int J Obstet Anesth 2005;14:104-7. Niu XY, Ding XB, Guo T, Chen MH, Fu SK, Li Q. Effects of intravenous and intrathecal dexmedetomidine in spinal anesthesia: A meta-analysis. CNS Neurosci Ther 2013;19:897-904. Wu HH, Wang HT, Jin JJ, Cui GB, Zhou KC, Chen Y, et al. Does dexmedetomidine as a neuraxial adjuvant facilitate better anesthesia and analgesia? A systematic review and meta-analysis. PloS One 2014;9:e93114. Kanazi GE, Aouad MT, Jabbour-Khoury SI, Al Jazzar MD, Alameddine MM, Al Yaman R, et al. Effect of low-dose dexmedetomidine or clonidine on the characteristics of bupivacaine spinal block. Acta Anaesthesiol Scand 2006;50:222-7. Mohamed AA, Salem RA. Intrathecal dexmedetomidine-fentanyl for labor analgesia: Randomized comparative study. J Anesthesiol Clin Sci 2015;4:1. Zhang H, Zhou F, Li C, Kong M, Lui H, Zhang P, et al. Molecular mechanisms underlying the analgesic property of intrathecal dexmedetomidine and its neurotoxicity evaluation: An in vivo and in vitro experimental study. PLoS One 2013;8:e55556. Gupta R, Verma R, Bogra J, Kohli M, Raman R, Kushwaha JK. A comparative study of intrathecal dexmedetomidine and fentanyl as adjuvants to bupivacaine. J Anaesthesiol Clin Pharmacol 2011;27:339-43.